The human body is an extremely complex machine that requires proper maintenance and fuel to run smoothly. If you have a demanding routine at home or at the gym, work long hours, or are following a restrictive diet, chances are that some days it gets a bit harder to get out of the bed and carry on with your usual activities. In that case, the answer may be in the quality of your meals. All living things need a source of energy to go on. Plants transform sunlight into energy, but animals and people depend on food. The amount of energy provided by any given food is measured in calories, and the total intake per day varies depending on your age, size, weight, and lifestyle. A moderately active adult 26-45 years old will need 2,600 (men) to 2,000 (women) calories average, and people from 46 to 65 will require only 2,400 (male) to 1,800 (female) daily calories in order to stay healthy. However, the quality of the fuel you feed your body with will make a big difference on your daily performance. When it comes to food quality, “energy density” is an important concept to grasp. It relates to the amount of calories per gram, ounce, or “bite”. 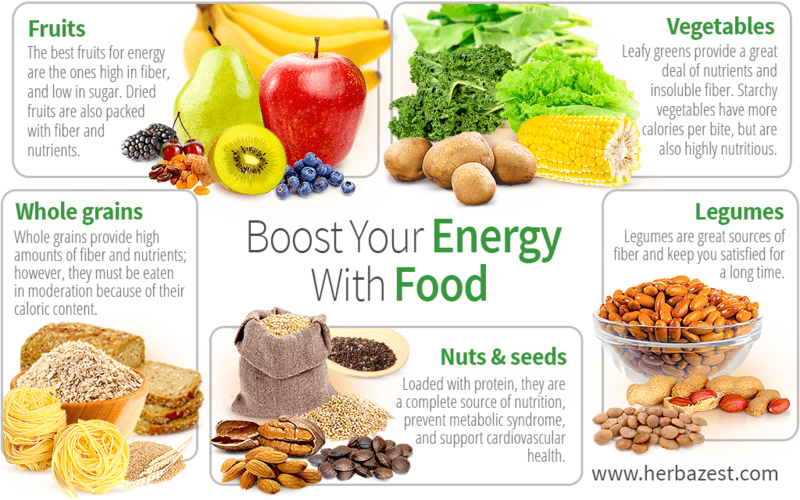 Energy dense foods contain the most calories per bite and are quickly transformed into glucose. When people feel tired, they often recur to simple carbs, mainly processed sugars and starches, which are energy dense foods. In nature, simple carbs are represented by fruits, which also provide a great deal of nutrients and fiber, and should be part of a balanced diet. On the other hand, low-density foods are the ones that provide less calories per bite but more nutrients and fiber. They need more time to be digested, so the energy is slowly released, giving enough time to the body to notice “the tank is full.” Complex carbs, such as whole grains and vegetables, are low density foods. Fruits. The best fruits for energy are the ones high in fiber, such as apple, banana, kiwi, and pear, as well as those low in sugar, such as blackberry, blueberry, cherry, and goldenberry. Dried fruits, such as prunes and raisins, are also packed with fiber and nutrients, and make a healthy snack in small amounts. Vegetables. Leafy green vegetables, such as kale, spinach, arugula, and lettuce, provide few calories per bite, but a great deal of nutrients and insoluble fiber. On the other hand, starchy vegetables, such as maize, potato, pumpkin, and sweet potatoes have more calories per bite, but are also highly nutritious. Legumes. Fulfilling and rich nutrient, beans, lentils, and peanut (yes, peanuts are legumes too) pack lots of energy, are great sources of fiber, and keep you satisfied for a long time, thus preventing snacking between meals. Nuts and seeds. Loaded with protein, essential amino acids, vitamins, minerals, and fiber, almond, chia, pecan, sacha inchi, and quinoa are not only a complete source of nutrition, but also prevent metabolic syndrome and support cardiovascular health. Whole grains. High amounts of fiber and nutrients are provided by whole grains, like rice, oats, and wheat, as well as by their products (bread, pasta, cereal, etc. ); however, they must be eaten in moderation because of their caloric content. It is important to note that energy levels depend on many factors, and feeling chronically fatigued may be a sign of a medical problem that needs to be checked. However, nutritional deficiencies are the most common reason for feeling tired, and that can be easily fixed by making dietary adjustments, ideally with the help of a health professional.